We’ve got our longstanding water woes pretty much licked around here. There are approximately 5400′ of new above-ground water lines installed on the farm in the past week, which took an awful lot of unrolling. 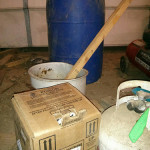 Eighteen 300′ rolls of polyethylene pipe unrolled to be exact. Sometime last year (who can even remember that far back?) we applied for an EQIP grant through the USDA NRCS. 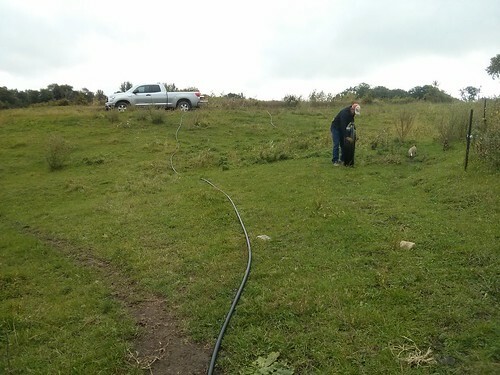 This particular grant is a cost-share program that helps pay for some of the infrastructure that’s needed to get set up for rotational grazing. In our case, we are on our way to having the fences ready, but we badly needed water. 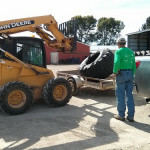 After completing the application and getting accepted (grants are awarded on a county-by-county basis) we then had a lengthy delay while we all waited around for the farm-bill to pass. After that debacle was behind us, the NRCS guys got down to drawing up a watering system for our farm and turning us loose with a map and a parts list. We brought all the pipe and fittings home and got to work unrolling all the pipe and getting everything hooked up. 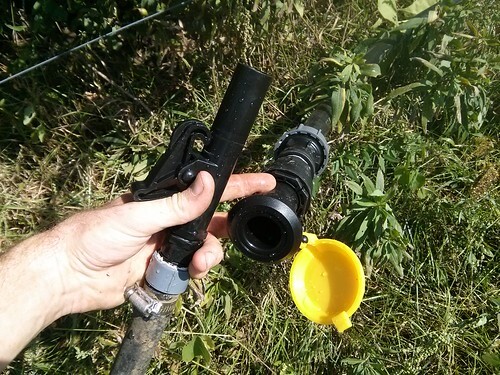 The Agri-Fit fittings go together pretty slick, especially the Plasson quick-couplers. We first saw the quick-couplers at a farm in Northern Missouri and we’ve waiting to get our hands on some ever since. The one thing that they don’t give much guidance on is the hydrant connection for the watering system. They pretty much give you one of the M18 3/4″ female adapters and leave you to figure it out on your own. This is the “official” version of our hydrant connector. 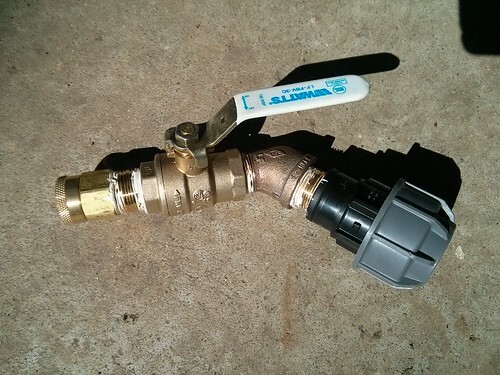 it’s a Hose-bib connector going to a full-port 3/4″ ball-valve with a 45° elbow that the Agri-fit fitting screws onto. After our “official” version is checked off by the NRCS, I’ll be switching it over to a “real-world” hydrant connector, which will mainly involve a short section of flexible 3/4″ reinforced rubber hose to connect the brass fittings to the polyethylene pipe. The problem with the official version is that the poly pipe is very rigid and subject to expansion and contraction. Not a good combination when you’re dealing with a relatively fragile hose-bib connection. I already broke one hose-bib connection putting the dang thing on. Good thing I bought an extra one. Anyhow, out in the field we’ve got two portable 155 gallon water tanks that connect to the Quick-connectors through a hose. 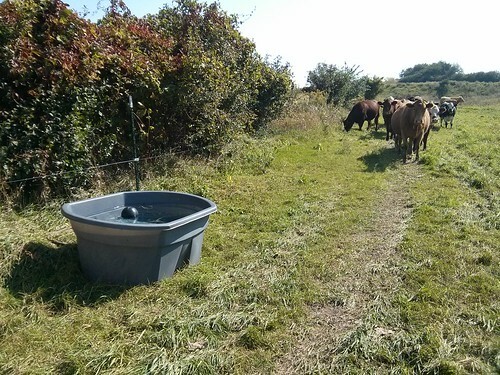 When we moved to the farm two years ago there were two reliable sources of water on the entire farm, a livestock waterer and a hydrant (less than 100′ apart). It’s a little too late this year for the new watering system to make a huge difference, but next year is going to be a good year for grazing. 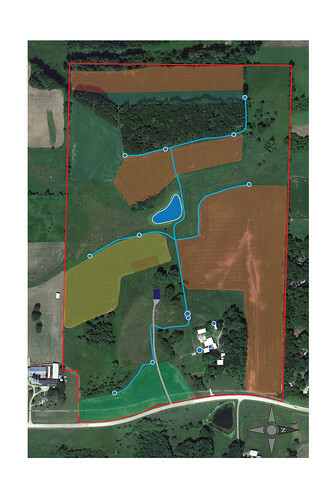 Our cows are never going to be more than 700′ from their water, which will mean a big improvement in their manure-distribution on pasture. 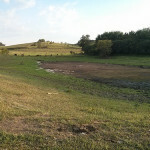 They also won’t be walking all the way across the farm, leaving bare erosion-prone paths through the pastures. This also means that we can get down to some actual rotational-grazing, giving our pastures a chance to rest before they’re grazed again. I’ll leave you with my soundtrack for the past week. When are you going to bury all of these lines? We’re never going to bury them, at least that’s the idea. If they were going to be buried, they’d have to be at least 6′ deep to keep from freezing and we still couldn’t use the portable tanks when it’s below freezing. Leaving them above ground makes it easier to find a leak when one does eventually occur.